Global SDG Awards are given to private sector companies & social enterprises with outstanding corporate responsibility programs. Winners & Finalists receive recognition, prestige and media coverage through out network of partners. If you do not agree to be bound by these terms, we kindly ask that you leave this website and refrain from using our services. The Global SDG Awards does not guarantee the accuracy, reliability or continuity of any of the information on this website. The content and services offered on this website are for general purposes only and are not intended to address your individual requirements. All material contained on this website (with the exception of the United Nations Sustainable Development Goal icons) is the property of The Global SDG Awards. All rights are reserved and any unauthorized use or reproduction is strictly prohibited. Our content may not be used for commercial purposes unless expressly authorized by The Global SDG Awards. Sustainability initiatives featured on our site remain the intellectual property of their creators. However, by submitting a corporate responsibility program for consideration, you agree to its publication on our site and reproduction in other publications produced by The Global SDG Awards. The Global SDG Awards accepts no responsibility for the information and/or content provided on any of our winners’ websites. The Global SDG Awards accepts no responsibility for changes made to any corporate responsibility or sustainability program subsequent to its appearance on The Global SDG Awards’ website. By submitting a sustainability initiative/program for a Global SDG Award, you confirm that you have read and accept the following and agree to accept the outcome in accordance with our evaluation system and criteria as outlined below. Our intention is to be fair when evaluating each initiative/program submitted for a Global SDG Award. Our evaluation system uses a 10-point scale for each of our 3 Pillars: Positive Impact, Potential for Scalability, and Magnetism & Inspiration. The Global SDG Awards applies statistical adjustments to judge’s evaluations before determining & announcing category finalists. a) services may be terminated by The Global SDG Awards, without cause, at any time, b) services may be terminated by you, without cause, by following the cancellation procedures via The Global SDG Awards customer support, c) The Global SDG Awards may terminate Services at any time, without penalty and without notice if you fail to comply with any of the terms of this Agreement or the intellectual property protections applicable to these Services, or d) “Notice of Termination of Services” by The Global SDG Awards may be sent to the contact e-mail associated with your submission. Upon termination, The Global SDG Awards has the right to delete all data, files, or other information associated with your submission. The Global SDG Awards and its affiliates, (collectively referred to as “The Global SDG Awards”, “we”, “us”, or “our”) is committed to respecting and protecting the accuracy, confidentiality and security of personal information when visiting our website(s) (the “Website” or “Websites”) and using our services. This Privacy Notice sets out our policies concerning the collection, use, disclosure and protection of personal information we receive from individuals accessing our Websites, or from customers using our services, as well as the types of cookies that The Global SDG Awards uses on our Websites. “Personal Information” means all information about an identifiable person who can be directly or indirectly identified by reference to the information. In some jurisdictions, the term “personal data” is used in local privacy laws rather than the term “Personal Information”. The Global SDG Awards uses the terms “Personal Information” and “personal data” interchangeably. “Service(s)” means The Global SDG Awards’ service offerings, including, but not limited to, the competitive review of corporate responsibility projects, initiatives, products, services, business models or pilots by our Expert Panel of Judges for award selection. This Privacy Notice is available to the public on our Websites, so that information about our policies and practices relating to the management of information is readily available to everyone. The Global SDG Awards may update this Privacy Notice from time to time. We will take appropriate measures to notify you about material changes in a manner that is consistent with the significance of the changes we make. However, it is your responsibility to review the most current version of this Privacy Notice as published on the Website. This Privacy Notice was drafted with the objective of complying with or exceeding the requirements of Canada’s Personal Information Protection and Electronic Documents Act (“PIPEDA”) and British Columbia’s Personal Information Protection Act (“PIPA”), as The Global SDG Awards is incorporated as a not-for-profit corporation in the Province of Ontario and its corporate headquarters are located in Ontario, Canada. However, The Global SDG Awards also does business in other countries, and non-Canadians also use the Website and the Services. Many of these other countries have their own laws applicable to the protection of Personal Information, which may or may not conflict with or contain more restrictive legal obligations than PIPEDA (including, for example, the European Union’s General Data Protection Regulation, known as “GDPR”). It is The Global SDG Award’s intention to comply with the privacy legislation of each of these jurisdictions. As such, this Privacy Notice outlines the minimum standards for The Global SDG Awards’ treatment of personal information. Where applicable laws contain additional requirements, The Global SDG Awards will ensure compliance with those laws. Should there be an inconsistency between this Privacy Notice and applicable local privacy laws, this Privacy Notice will be interpreted to give effect to the local privacy laws and The Global SDG Awards’ compliance therewith. The Global SDG Awards is responsible for Personal Information under its control, and will take all reasonable steps to handle such Personal Information fairly and to ensure compliance with applicable laws in relation to the processing of Personal Information. • Voluntary Information: If you visit our Website, request or subscribe to marketing materials, download content, contact us, or purchase, register or subscribe to the Services, we will collect Personal Information that you voluntarily provide to us (that may include your IP address, name, title, address, email address and telephone number, and contact preferences) in order to respond to your request or inquiry. • Technical Information: In order to enhance the functionality of our Website and to provide you with a better user experience, we may collect technical information transmitted by your device, including certain software and hardware information (e.g. your language preference, the type of browser and operating system your device uses, access time, the domain name of the website from which you linked to our Services, etc. • Analytics Information: We collect information about your use of our Services, such as log files, user activity (e.g. pages viewed, the amount of time spent on particular pages, online browsing, clicks, actions), time stamps, alerts, etc. This information is collected for, among other things, troubleshooting errors and bugs, as well as for research, profiling and analytics purposes about your use of our Website and Services, and providing you with tailored marketing and personalized products and Services. You are under no obligation to provide Personal Information to us. However, certain Personal Information is essential for the use and quality of your experience using the Website and/or the Services. a) to develop, manage, deliver and support our products and Services, b) to ensure high standards of service to customers, c) to contact our customers with regard to the Services, as well as administrative or account-related information, d) to respond to inquiries and fulfill requests, such as sending requested materials or documents regarding our Services, e) to provide marketing and promotional communications (where this is in accordance with applicable law), and to determine the effectiveness of marketing and promotional campaigns, f) to verify a customer’s identity, g) to process transactions, h) to identify and disclose any suspected unlawful, fraudulent, or other improper activity connected with our Website and Services, or i) to comply with applicable laws, comply with legal and regulatory processes, enforce our terms and conditions, and protect our operations, rights, safety or property. • Where you have given us consent: We collect, use and share your Personal Information for the purpose of marketing to you, where you have given us consent to do so. At any time, you can withdraw your consent to us marketing to you by emailing us at [email protected] or by following the unsubscribe instructions provided in the email or other communication that you receive from us. • Where the processing is necessary for the performance of your contract with us: We collect, use and share your Personal Information where such information is essential to provide Services to you. You are under no obligation to provide such Personal Information to us. However, you might not be able to access and/or use some or part of the Services if you choose to withhold Personal Information that is required for those Services. • Where the processing is necessary for us to comply with our legal obligations: In some circumstances, we are legally required to collect, use and share your Personal Information. For example, in connection with the prevention, detection or investigation of a crime or fraud. Where we process your Personal Information in order to comply with our legal obligations, we may need to retain such information in order to demonstrate that we have complied with our legal obligations. • Where we have legitimate interests in the processing: We collect, use and share your Personal Information where such processing is necessary for our legitimate operating interests, unless we determine that those interests are overridden by your interests or your fundamental rights and freedoms. We use third party service providers in order to advertise and market to you and manage our advertising activities. Your Personal Information may be shared with these third parties in order for them to provide such services to us. The use, collection and disclosure of Personal Information may involve The Global SDG Awards transferring Personal Information across borders. Where we transfer Personal Information from Canada to other countries in which applicable laws do not offer the same level of data privacy protection as in your home country, we take steps to ensure that your data is treated securely and in accordance with this Privacy Notice. For example, we use approved contractual clauses, intra-group agreements and other measures designed to ensure that the recipients of your Personal Information protect it. The Global SDG Awards may use and disclose aggregated and anonymous or de-identified information to third parties, including the general public. For example, we may analyze and publish reports on usage trends or statistics from across our global customer base for information or marketing purposes, but only after we have removed any identifying Personal Information. This type of aggregated and anonymous or de-identified data can help The Global SDG Awards improve our Services and advertising, and it can be used by our customers and the public to better understand related sustainability and corporate responsibility trends. We use certain types of Cookies on the Website. “Cookies” are small text files containing small amounts of information which are downloaded to your device when you visit a website, so that the website can remember some information about your browsing activity on the website, either for the duration of your visit or for repeat visits. The cookies are then sent back to the originating website on each subsequent visit, or to another website that recognizes that cookie. Cookies are useful because they allow a website to recognize a user’s device. They do many different jobs, like letting you navigate between pages efficiently, remembering your preferences, and generally improving your user experience. In general, cookies make the interaction between you and websites faster and easier. • Session Cookies: These are temporary cookies that expire when you close your browser. A session cookie assigns a randomly-generated, unique identification number to your device when you access the Website. Assigning your device a number facilitates the proper functioning of the features of our Website by permitting us to maintain a persistent “state” for your session, including information relating to transactions you might make. We also use session cookies to collect anonymous information (i.e. information that does not identify you personally) about the ways users use the Website, such as which pages they visit, which links they use, and how long they stay on each page. We analyze this information (known as “click-stream information”) to better understand our users’ interests and needs and to improve the content and functionality of the Website. • Persistent Cookies: Unlike a session cookie, a “persistent cookie” does not expire when you close your browser. It stays on your device until the expiration date set in the cookie (for example, at the end of a calendar month) or until you delete it. Persistent cookies can be used to “tag” your device so that the next time you visit (or someone using your device visits), our server will recognize you, not by name, but by the “tag” on your device. This will enable us to provide you with a personalized experience even if we do not know who you are. It will also allow us to collect more accurate information about the ways people use the Website, for example, how people use the Website on their first visit and how often they return. Using persistent cookies permits us to provide you with a more personalized experience and, in some cases, may save you the trouble of re-entering information already in our database. • Strictly Necessary Cookies: These cookies are essential for the running of our Website. Without these cookies, parts of our Website would not function. They enable you to move around the Website and use its features, such as accessing secure areas. These cookies do not track where you have been on the Internet and do not gather information about you that could be used for marketing purposes. • Performance Cookies: These cookies are used to monitor the performance of our Website, for example, to determine the number of page views and the number of unique users the Website has. Web analytics services may be designed and operated by third parties on The Global SDG Awards’ behalf. The information provided by these cookies allows us to analyze patterns of user behavior, and we use that information to enhance user experience or identify areas of the Website which may require maintenance. These cookies do not collect information that identifies a visitor. All information collected through these cookies is aggregated and therefore anonymous. • Functional Cookies: These cookies allow the Website to remember choices you make (such as your preferences, language or the region you are in) and provide enhanced, more personal features. These cookies can also be used to remember changes you have made to text size, fonts and other parts of web pages that you can customize. The information these cookies collect may be anonymized, and they cannot track your browsing activity on other websites. • Targeting or Advertising Cookies: These cookies, which may be placed on your device by us or our trusted third party service providers, remember that you have visited a website and use that information to provide you with advertising which is tailored to your interests. They are also used to limit the number of times you see an advertisement as well as help measure the effectiveness of the advertising campaign. They remember that you have visited a website and this information is shared with other organizations such as advertisers. Without these cookies, online advertising you encounter will be less relevant to you and your interests. • Web Beacons: When you visit our Website, your device may receive one or more “web beacons” in order to assist us with delivering cookies, to collect anonymous information about the use of the Website by our users, and to deliver customized or targeted content to you on the Website and through our partners. Web beacons (also referred to as “tracking pixels,” “1×1 gifs,” “single-pixel gifs,” “pixel tags,” or “action tags”) are graphic images, usually no larger than a 1×1 pixel, placed at various locations on the Website. They also help us identify browser types, search terms that bring users to our Website, and the domain names of websites that refer traffic to us. We may also utilize web beacons to provide us with more information on any emails we send out. In particular, a web beacon in an email communication will send us information to let us know that you have received, opened, or acted upon an e-mail you have chosen to receive from us. The Global SDG Awards’ Website contains links to third party sites, including the websites of our partners, and we recommend and encourage you to read the privacy policies posted on those third-party sites. The Global SDG Awards is not responsible for and has no control over information that is submitted to, or collected by, these sites. The Global SDG Awards will retain your Personal Information for as long as necessary to fulfil the purposes for which it was collected, or to comply with applicable legal, tax or regulatory requirements. After this time, any Personal Information you have provided to us will be deleted or made anonymous. Please note that we may be required in certain circumstances to retain your Personal Information indefinitely (for example, in order to comply with our policies and procedures in connection with self-exclusion). We will take all necessary steps to ensure that the privacy of your Personal Information is maintained for the period of retention. • Accuracy: The Global SDG Awards will make reasonable efforts to ensure that the Personal Information collected and used by us is accurate, complete and up-to-date to meet the purposes for which it is collected and used. The Global SDG Awards does not routinely update Personal Information unless it is necessary to meet the purposes for which it is collected. The Global SDG Awards therefore relies on you to maintain the accuracy of your Personal Information. • Correction: You have the right to request correction to your Personal Information in the event it is inaccurate, incomplete or out of date. • Access: You have the right to access your Personal Information. This includes (a) identification of and access to any or all of your Personal Information under The Global SDG Awards’ custody or control; (b) an explanation of how that Personal Information is or has been collected, used or disclosed by The Global SDG Awards; and (c) the names of any individuals and organizations to which your Personal Information has been disclosed by The Global SDG Awards. • Erasure: You can request that The Global SDG Awards erases your Personal Information where there is no compelling reason for us to continue processing it. • Data Portability: This right allows you to obtain the Personal Information that you have provided to us with your consent, or which was necessary for us to provide you with our Services, in a format which enables you to transfer that Personal Information to another organization. You have the right to have your Personal Information transferred by us directly to the other organization, if it is technically feasible. • Restriction of Processing: You have the right in certain circumstances to request that The Global SDG Awards suspends processing of your Personal Information. Where we agree to suspend our processing of your Personal Information, we will still be permitted to store your Personal Information, but any other processing of this information will require your consent, subject to certain exemptions. • Objection to Processing: You have the right to object to The Global SDG Awards’ use of your Personal Information, where it is processed on the basis of our legitimate interests. However, The Global SDG Awards may continue to process your Personal Information, despite your objection, where there are compelling legitimate grounds to do so or we need to process your Personal Information in connection with any legal claims. • Withdrawal of Consent: Where The Global SDG Awards has relied upon your consent to process your Personal Information, you have the right to withdraw that consent. Any request to exercise your rights with respect to your Personal Information must be made in writing (by mail or e-mail) to The Global SDG Awards’ Executive Director and provide sufficient detail to identify the Personal Information and the action being sought. We will respond to written requests within thirty (30) days of receiving such request. We will either make the requested information available within that time period, or provide written notice of an extension where additional time is required to fulfil the request. If The Global SDG Awards cannot fulfil your request in full or in part, you will be provided with a response in writing that explains the reason for refusal and the further options available to you. The Global SDG Awards will make reasonable security arrangements and use appropriate technical and organizational measures to protect all Personal Information under our control (regardless of the format in which it is held) against unauthorized access, loss, theft, collection, use, disclosure, duplication, modification, disposal or similar risks, by both individuals outside of The Global SDG Awards as well as within. The types of security safeguards that we use vary, depending on the nature and sensitivity of the Personal Information, the harm that might result from its improper use or loss, and how it is stored (e.g. in paper or electronically). The Global SDG Awards’ security safeguards include locked filing cabinets, physically secured offices where Personal Information is held, limited employee access, the use of IDs, passwords, restricted servers, firewalls and encryption for electronic files, as well as contractual requirements for service providers to provide comparable security measures. The Global SDG Awards will use appropriate security measures when disposing of and destroying Personal Information, such as shredding documents and deleting electronically stored information, in order to prevent unauthorized access. The Global SDG Awards will continually review and update our security policies and controls as technology changes to ensure ongoing Personal Information security. This section applies specifically to The Global SDG Awards’ customers residing or carrying on business in the European Union or European Economic Area, where the GDPR (or local legislation implementing the GDPR) applies. For the purposes of GDPR, The Global SDG Awards will be the “Processor” and our customers will be the “Controller” (as these terms are defined in the GDPR) with respect to any Personal Information that The Global SDG Awards processes on behalf of our customers through use of our Services. The Global SDG Awards will comply with its obligations as Controller under the GDPR with respect to personal information processed by The Global SDG Awards on its own behalf. 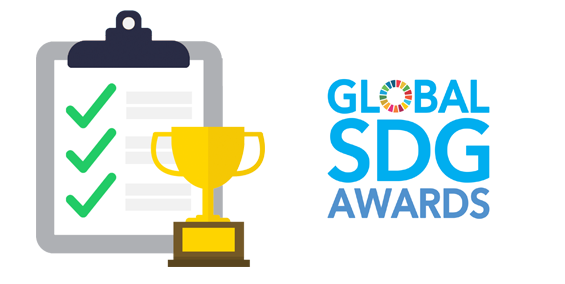 Complaints, concerns or inquiries regarding the GDPR should be made in writing (by mail or email) to The Global SDG Awards’ Executive Director. You also have the right to make a complaint to the ICO (www.ico.org.uk/concerns) or your local national data supervisory authority. All complaints and inquiries will be investigated and responded to in accordance with this Privacy Notice and applicable laws. If The Global SDG Awards’ Executive Director is unable to address your concerns, the issue will be escalated to The Board of Director in accordance with The Global SDG Award’s Escalation Policy. By using our Websites, you will be deemed to have consented to the collection, use and disclosure of your Personal Information by The Global SDG Awards in accordance with this Privacy Notice.